Picking up from the Globe Run for Home, the team went out to support the NATGEO Earth Day Run. It was a very good day as we have 3 runners who achieved their new Personal Records. 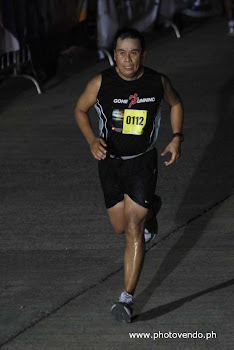 First off was Dennis Villanueva who clocked at 1:58:26, which was 7 minutes better than his last PR at 2:05:13 at the 2011 Globe Run for Home. He was determined and really prepared for this run. When I asked him at the starting line what his goal was, he said he would target less than 2 hrs, and he did. Next was Allen Co who finished at 2:38:14, which was 5 minutes better than his latest PR also at the Globe Run. Apparently he was a bit late at gun start as he was trying to figure out where the starting line was. But after a while he catched up with us and proceeded to run his pace. Allen was consistent in improving his 21k run and now have 4 half marathons. He is eyeing to improve further his time in his next race in May. Finally, Tiffany Qua, who promised that she will do better in her 2nd half marathon. She finished at 2:47:32 which was 3 minutes better than her last run (Globe Run). She remains to be determined and focused on her goal, which was consistent from her first run. She was conscious of her time as she checks once in a while if we are still within target. I bet, just like in the office, being a manager as she is, she always keeps track of their metrics and make sure that it is within target. According to her though, it was a more difficult run this time. Probably it's because she was advised by her doctor to take some rest after the Globe Run and was not able to continue her training afterwards. But she said she will improve her time, and she did. Now, she is looking forward for a better performance in her next race. 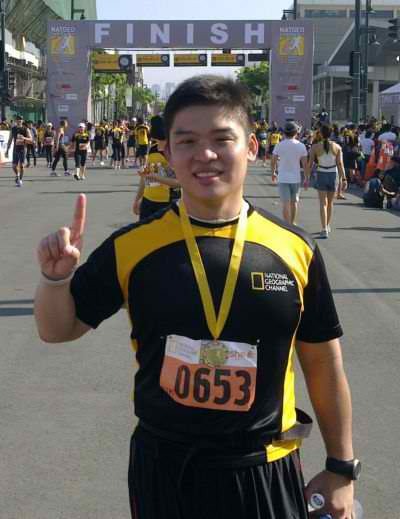 Egay Jardiniano, whose last half marathon was last year at the Rexona Run finally tried another half marathon. 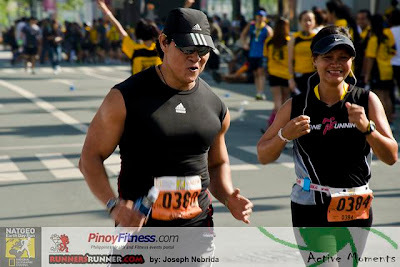 Egay is a body builder and he barely do runs but got motivated by his wife Cherry to run. He finished strong at 3:02:56, not quite a PR this time but he felt that this was a better run as compared to his last half marathon. I'm sure being a disciplined fitness buff, he will improve his future runs. Meanwhile, Cherry Jardiniano was initially pacing with us in support to Tiffany, but later on paced with Allen to give extra support. She did finish in 2:31:13. She had no plans to do PR in this race but will definitely do in the next races. After she crossed the finish line, she came back and meet us and she ran alongside Tiffany to support her until they reached the finish line. But I guess, she wanted to run more and agains went back to meet her husband (Egay) and ran with him until they reached the finish line. Cherry is getting stronger and I'm sure she will hit sub-2 hrs anytime soon. A happy couple, Egay and Cherry. Nice to see these two help each other out. 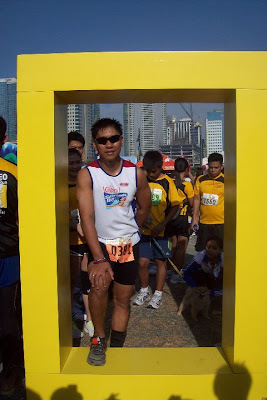 As for Me and Jay, we remained to be on a pacer role, but I figured, the aggressiveness of these runners to improve their time is kicking in and we have to train harder as these guys might become our pacer someday if we dont shape up. Dennis obviously had all the time to enjoy while waiting for all of us. Great job Dennis! Allen, happy with his new accomplishment. Tiffany with the body guards! With Tiffany's cousins who likewise had a great time. These runners were determined to challenge their personal best as they discover their potential and ability to stretch their goals. They are becoming more excited in setting their new target as they experience the joy of running and the sense of accomplishment attached to it. As I have always believed, nothing is impossible, everything is achievable if you believe in yourself. Preparation, determination, and a positive mental attitude will lead you to success. I should start training myself as these guys have no way to go but to get faster and better.